MGM silent. 65 minutes (6 reels). US (NYC) premiere: 11/8/25. Cast: Jackie Coogan, Joan Crawford (as "Mary Riley"), Max Davidson, Lillian Elliott, Alan Forrest, James Mason, Stanton Heck, Dynamite the Horse. Credits: From the story by Willard Mack. 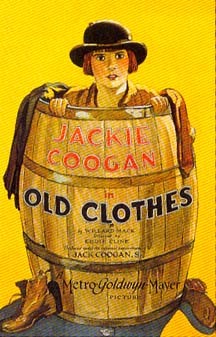 Producer: Jack Coogan, Sr. Director: Eddie Cline. Camera: Frank B. Good. 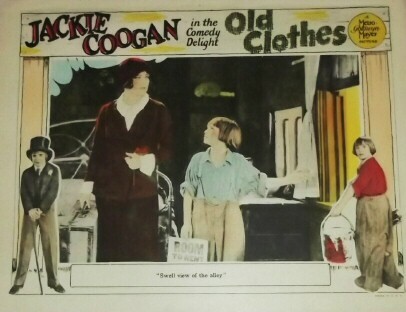 • Old Clothes was a sequel to Coogan's earlier 1925 film, The Rag Man. 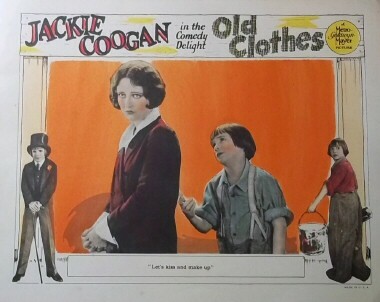 Coogan and Max Davidson reprised their roles and Eddie Cline again directed. • This was Joan's first appearance with her new name, Joan Crawford. • Musical numbers accompanying the film at NYC's Capitol theater in 1925: " Southern Rhapsody," overture; "A Leaf From Nature's Book," a Screen Art production: Louise Loring, soprano; "Dutch Dance," with the ballet corps; Gladys Rice and William Robyn, duet; Doris Niles, John Triesalt and ballet corps in "Bacchanale" from "Faust." 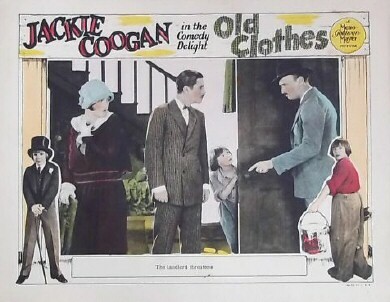 "Old Clothes," Jackie Coogan's latest production, is the chief screen offering at the Capitol, and those who have enjoyed the past performances of this youngster will be agreeably entertained by this new production. 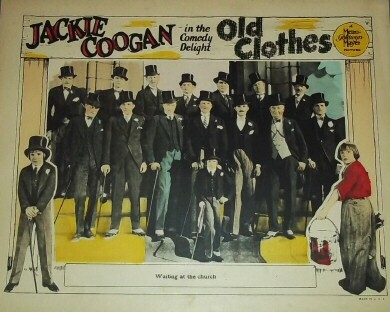 Something had to be done to cope with Jackie's present age (he is on the sunny side of 11) and, therefore, the producer, which means Jack Coogan Sr., has seen fit to have Jackie characterize a somewhat precocious youngster, who at the same time is thoughtful and lovable. His acting, which is thoroughly expressive, is more studied than it was in "The Kid," "Peck's Bad Boy" or "Oliver Twist." However, it suits the part he plays, that of Tim Kelly, business partner of an old fellow named Max Ginsberg, Tim being the brains of the so-called junk firm. At first Tim and Ginsberg are depicted on the threshold of financial failure. Tim is having his last game of golf and old Ginsberg is having his last cigar in his comfortable home. The images fade out from prosperity to rags, and little Tim is portrayed wearing trousers that were once knickerbockers. Their copper stock has gone to to pot; all it is worth is the paper on which it is engraved. When Mary Riley joins the partners they want to surprise her by repapering her room. They run short of wall paper and therefore make use of the copper-stock certificates. The scenes in which little Tim and old Ginsberg are depicted working at the wall-papering job are quite amusing, and the result of their efforts is a nightmare. A bad man follows Mary wherever she goes and Tim decides to push a brick off the window sill without looking where it drops. Unfortunately it lands on Ginsberg's head, the scoundrel being uninjured. Nathan Burke, a wealthy young man, brings Tim home in his expensive car when Tim's junk cart is smashed by a truck. The boy is not hurt. However, when the adjuster comes to Tim's abode to settle for the accident, Tim succeeds in wheedling $300 out of him, with a promise of a like sum for his cart. The adjuster goes out for more money and when he returns with it he is amazed to see Jackie going through the contortions of the Charleston. The consequence is that Jackie receives only $50 for the cart, much to Ginsberg's chagrin. There is a thick layer of hokum in this production and the story turns out happily, even all the copper stock stuck on the wall returning to its full face value. Jackie's eyes and his precocious antics displayed in this photoplay are constantly amusing. Many of the situations brought forth peals of laughter yesterday. Joan Crawford is satisfactory as Mary Riley and Max Davidson is splendid in the rô1e of Ginsberg. 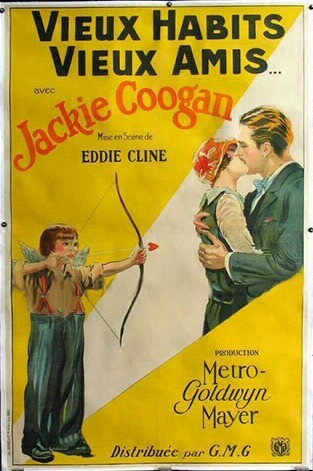 The girl, Joan Crawford, is a discovery of Jack Coogan, Sr. She is very attractive and shows promise. 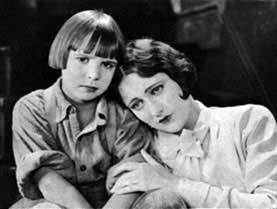 The love interest, supplied by Alan Forrest and Joan Crawford, should satisfy such spectators as the antics of the small star fail to amuse--if any. 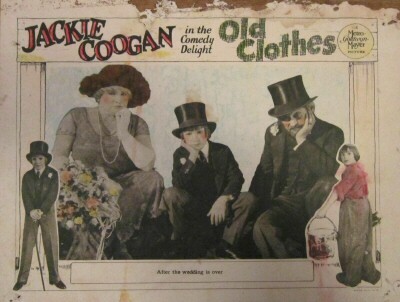 Little Coogan wears a big derby hat, walks with his hands behind his back, and is generally grown up. The others fulfill their roles satisfactorily, and to the credit of Eddie Cline, the director, it must be said that he has injected clever business at spots. Inasmuch as the recent Coogan films haven't done so well, and as this one is cheaply produced, it doesn't seem to be in the stars that Old Clothes will be a mop-up for anybody. If you've seen Old Clothes and would like to share your review here, please e-mail me. Feel free to include a star-rating (with 5 stars the best), as well as a photo of yourself to accompany your review and any of your favorite titles from the film. 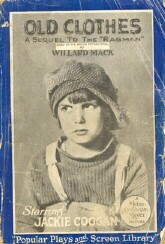 1925 photoplay by Willard Mack (front and back covers). See the Books Related to Joan Movies page for more info.